Why do we need trained agricultural scientists you may wonder? Well, the world needs enough food to feed the ever growing population. 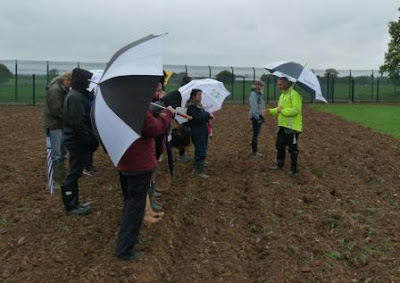 And, as our first group of students on the University of Hertfordshire’s MSc in Environmental Management for Agriculture have been discovering, food production needs to remain sustainable. That is we need to produce food to meet human needs while ensuring sustainability of natural systems and the environment, so that these needs can be met now and for future generations. At a recent speech at Rothamsted Research on “making the food and farming industry more competitive while protecting the environment”, Owen Paterson, Secretary of State for Environment, Food and Rural Affairs, highlighted that the delivery of food security requires capacity building in the area of sustainable agriculture – identifying that more agricultural scientists are required. The MSc in Environmental Management for Agriculture course was designed to fill this need for skilled agricultural scientists and managers who can work innovatively in all aspects of agriculture – from the research laboratory and the farmers’ fields, through agricultural policy and to the supermarket. Students get a sound foundation in environmental management skills, including environmental auditing, and they spend fifty per cent of their time studying agriculturally related topics; including integrated farm management, crop pathogens, pests and weeds and their integrated control. It can be taken either as a full-time or part-time course with individual modules delivered as short courses with BASIS CPD points.